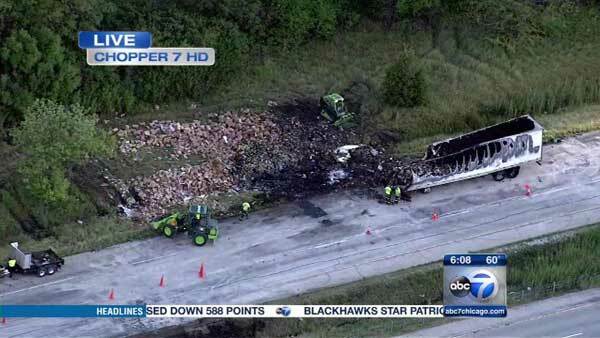 A truck driver was killed in a crash involving two semis on southbound I-55 near Braceville, in Grundy County. BRACEVILLE, Ill. (WLS) -- A truck driver was killed in a crash involving two semis on southbound I-55 near Braceville, in Grundy County. Only the left lane was open Tuesday morning, as crews continued to clear the debris. Illinois State Police said the semis collided around 8 p.m. Monday. The crash shut down I-55 in both directions while first responders extinguished a resulting fire and investigators looked into the cause of the crash. One driver died. The other driver was treated for minor injuries. State police did not release further details on the drivers. The right lane of southbound I-55 is expected to reopen around 10 a.m. Tuesday.